Why Do You (or Your Client) Have a Website? In other words there is always something you (or your client) want or need your website visitors to do. That’s why you have a website! Well, last week Chris and I came across probably the biggest single revolution in getting users to engage with and take action on your website since the start of video. It called Videopal and you have already seen an example I made myself with no equipment except my home camcorder (or use your phone) and a sheet out of my wife’s cupboard! But you can not only do these transparent background videos, you can do stuff like this – check these out! Use it on your clients websites - imagine THEM talking to their customers from their website! It’s really a game changer and a very well put together app. And just launching later today, a small one of payment gets you lifetime access. You'd think this would be an expensive package, wouldn't you? Stand by to be Pleasantly Surprised! It starts at a one-off $27 payment. Bit of a no brainer really. Chris and I are assembling some best practices and most effective ways to use Videopal, and hey are yours as a bonus from us if you want them and pick up VideoPal here. Update: pelase see below on this post the upsells we recommend. Bascially, you need the Agency license if for no other reason than you can remove the “Powered by VideoPal” banner on your videos. So please budget for this. The custom bonuses are available with your Agency license because, to be honest, that’s the version you need. Custom Bonus 1: Get Your Visitors Crawling over Broken Glass to Buy, Optin or Call! Whether you are in ecommerce, local client marketing, affiliate marketing or building a list, we’ve compiled a knock it out the park guide to the BEST way to use VideoPal’s amazing features to get website visitors doing what YOU want them to do! Yup it’s true. VideoPal will help you rnak higher. We’ll explain why, and tell you how to get this ranking boost. Custom Bonus 3: How to Get Local Businesses Begging You to Take their Money! VideoPal offers some absolutely gobsmacking ways to get local businesses literally begging you to take their money! In this bonus we explain exactly how you can do this – and how you can earn additional 2-300 bucks straight up at the start of your contract with them. Bonuses from the VideoPal creators. In addition the VideoPal creators have kindly offered us, which we can give to you too if you purchase through our link. VideoPal Extra Bonus 1: Todd Gross (Mr Video) own top selling product “Green Screen Profit” – amazing! VideoPal Extra Bonus 2: Five professional Todd Gross videos from the professional present himself that YOU can use for YOUR marketing. VideoPal Extra Bonus 3: Get Another FIVE (5) Bonus 2D Characters Video Ready to use with VideoPal. VideoPal Extra Bonuses 4 through 14: Yes that’s Right! Note you must see our Affiliate ID 15742 on the checkout page to get the bonuses – see the image at the foot of this post. You’d think this was going to be an expensive package wouldn’t you? Well, it starts at a one-off $27 payment. Bit of a no brainer really. Chris and I promote stuff – like, never! We only tell you about stuff WE use in OUR business. And this is one of those. PS – Details and Upsells recommended. Initial purchase is a one-off $27 but increasing over time, so don’t hang about! Get it quick. After the launch it will be $27 per month, which is about right for the immense value. Get it now for a one-off! There are two purchases we recommend. A Deluxe version is $44 and contains a big upgrade in characters and software capabilities. It’s a one off payment, so if you imaging it srpread over a few years of use it’s what, a buck a month. We recommend it. So please budget for all 3 depending on your circumstances. Chris and I think it’s worth it and when you compare it to the cost of a monthly subscription, it’s dirt cheap. There are 2 other upsells which look good but which I have not reviewed and cannot say yes or no to. Get them if they make sense to you, but not otherwise. What’s not to love about this, since seeing the webinar and now this demo I can’t stop thinking about the different uses for this. However, for me, the real kicker is that this can be fun as well. Thank you also for the promised helpful bonuses to get buyers up and running or at least waving our arms – maybe running will come later. Yes John you are 100% right. It’s perhaps the best low cost app we’ve seen for years, and super effective. When is this releasing? I don’t see any purchase option. Alan the link is up now! In order to get the Agency License, Do I need to buy the Initial Purchase? And then upgrade it? Hi John I have just purchased videopal from your link and your affiliate code is not showing on any receipt? Hi Kevin not sure if it shows on the receipt but you need to check at checkout that the code is on the checkout page. Now you have purchased, look in the JVZoo product download area. I’ve just uploaded the bonuses so if you got it through us, you’ll see them there. Hi Mike you can do that with the basic product but you will have the “Powered by VideoPal” logo showing on your video. That’s one of the 2 reasons we recommend the Agency license. Hope that helps clarify! Yes you can Mark! Definitely! That’s what I did. So you have a choice of 2D characters, 3D Characters, your own video, or prerecorded real spokesperson messages. And for audio – all the choices too of your own soundtrack, dubbed audio, or text to speech. Update to my previous post. After what seemed like an eternity I finally got your link to work. Just purchased Video Pal Developers License via your affiliate link. However, when I tried to open the pdf “How to get the best results from Video Pal” for the bonus there was an error message saying it cannot be opened because of either not a supported file or file has been damaged. Would appreciate if you can send me the pdf bonus without the error. Thanks. Robert pleas send a ticket to [email protected] and we’ll take care of it. Refer Kari to the comment here on this page so she knows to send it! Hi Pete – great! You’ll find the bonuses in the JVZoo product delivery area. Just click on the link in your JVZoo purchase confirmation email. The bonus pdf would not load even after several attempts. Tony please check again – there was indeed an issue hopefully fixed now! An exciting time for sure… grabbed the 3 pack plus training as they say in for a penny, in for a pound. I’ve purchased the agency licence last night. Just going through the videos and tutorials. The VideoPal software is simply amazing! I had no idea how brilliant it actually is. I am completely stunned by what I’ve discovered already. Purchasing the agency licence is a no brainer. Thanks for bringing the Videopal software to my attention! I checked this page on my Android phone and I cannot see your video. does that mean these overlays wont work in mobile phones? They do definitely work on mobile. In fact, that they cracked the problem with the iPhone is one of the reasons I am so impressed with them. Not sure why it’s not playing on your Android, but certainly it should do. VideoPal plays on Android and iPhone and tablets. Oh ok cool. I’ll try and work out what it is. I have same problem, and it doesn’t work on my android phone? As I can see in video demo, in created script appears videopal URL, and it’s a problem, if I should give this script to my client! My client can see this URL, and check VieoPal web site, than by service directly from VideoPal, instead from me. Hello Miro – with the Agency license you can remove the VideoPal URL, so you’ll be fine with your clients. VideoPal works on Android, I do not know why your phone would have an issue – would be a good one for VideoPal support, I’ll ask them. Hello John and thank you for your reply. I know that VideoPal URL from avatars, but is it also removed from the code/ script which is needed to deliver to the client? Miro you are worrying about something unnecessarily. I think the number of customers who understand or are even going to want to look at lines of code are virtually non-existent. I suggest that you would in any case install the script on their site for them. Hey John, just letting you know I checked this on my Samsung 7 phone and it played fine in mobile. Where are the vp-videos stored? Can I store them within the folder of my website or anywhere else? ON the VideoPal server I believe. Thanks for bringing this software to my attention. Purchased the agency license over the weekend and my mind has not stopped burning rubber thinking of all the great client getting ideas we can use. Yes I agree – mind is spinning! Excellent plan Sean! Let us know how it goes! 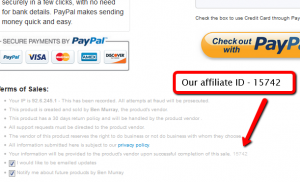 I bought the front end offer through another affiliate but not the OTO’s. I don’t suspect there is a way to get the deluxe upgrade and agency license through your link for your bonus training. It looks like I was able to make the purchase for the OTO’s through your link. I’ll look forward to the special bonus training. I went to buy it wanting the agency version. But I see just one price of $35. Can you explain? Hi Garrett – you buy the basic version first, and then you can upgrade to the Agency version. Hi Mike – the bonuses are in the JVZoo download area which you get to from the link in your JVZoo email or by logging in to your JVZoo account! Well, I finally had time to look at this. And boy am I glad I did. I know that I paid a higher price than most, but it’s still worth it. I think this tool will increase engagement on my sites and products. One question. What color sheet did you use as your background when you made your videos? I thought I had to buy a “green screen” to do the transparent background. Thanks again for sharing this tool with us my friend. Hi Tim – great! I used a sort of bluey-green sheet. The main thing I believe is that it is a color that is different from your skin/hair and anything you are wearing. It does not have to be green, but there is guidance in the VideoPal training videos. Is the agency version the same as the Deluxe which they are asking $44 for? Hi Garrett – no, they are not the same. The Deluxe has a lot of additional features/characters etc, the Angency allows you to remove the “Powered by VideoPal” banner and logo, and also allows you to install VideoPal on client sites. I recommend you get both, honestly, the price is really good for something of this quality.